On the 24th November the girls in Virgin Mary Girls' National School experienced a little piece of history. 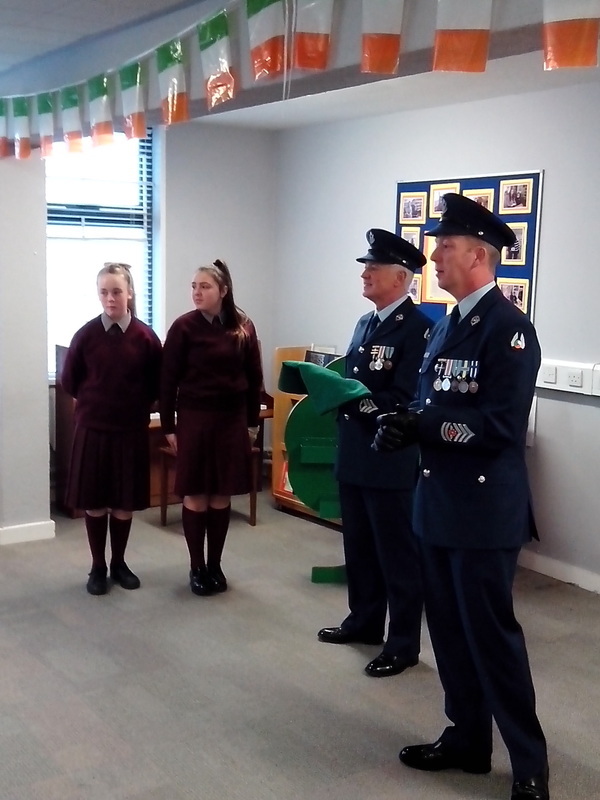 Two members of the Irish Air Corps came to the school to present us with our national flag and a copy of the 1916 Proclamation. They explained to a packed Library that they had come to present the flag, and that it was a part of the government’s commemoration of the 100th anniversary of 1916, and that next year every school in Ireland will raise the flag on March 15th. This day will be known as Proclamation Day. 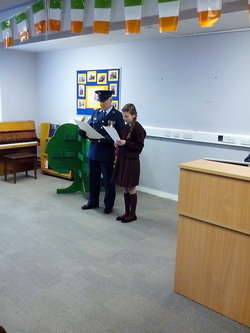 They also invited the children to write their own version of the proclamation which will be read out on that day also. One of the Air Corps officers proceeded to read the proclamation, and he stopped after the 3rd paragraph, so Robyn Touhy from 6th class could read the next paragraph. This paragraph mentions equal rights and opportunities for all Irish citizens and contains the phrase “cherishing all the children of the nation equally”. Robyn read this very clearly and confidently. 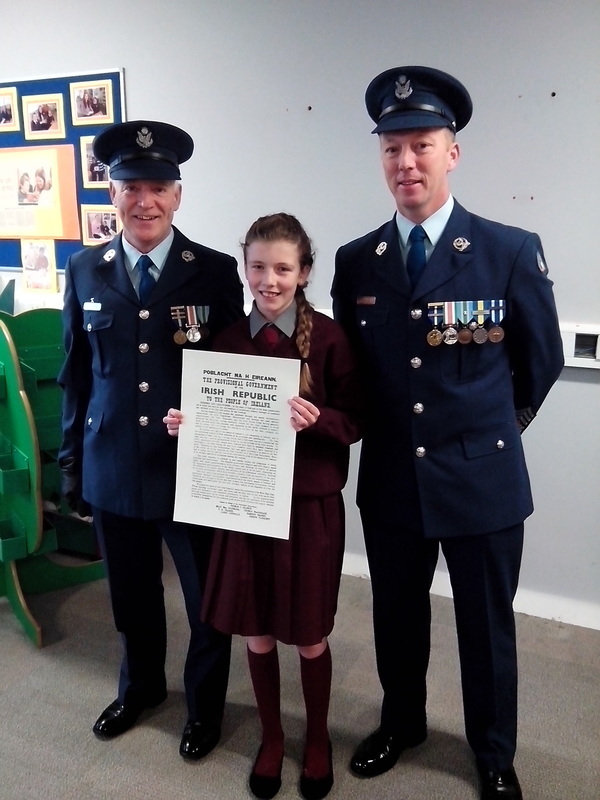 After reading the proclamation the flag was presented to Shauna O'Leary and Saoirse Coffey of 6th class and a copy of the proclamation was presented to Robyn Touhy. It was explained to all of us that we must show respect to our national flag, and that there were some simple rules we must follow; the flag should never touch the ground, when it’s flying with other flags it must be the highest and that it must be taken down at night time. The ceremony finished with everybody standing to attention and singing our national anthem, “Amhrán na bhFiann” . The Air Corps officers saluted while we sang the anthem. Ms. Nolan conducted the choir, accompany the singing Mr. McGuinness played the piano.